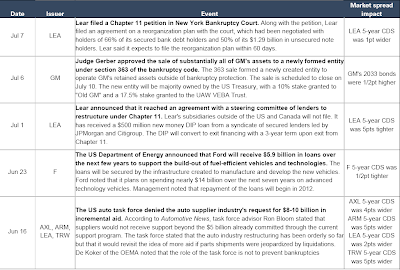 Based on the comments made by the judge overseeing GM’s bankruptcy process, the “New GM” is expected to exit bankruptcy on June 10 with $48 billion in liabilities (part of which is $17 billion of debt and and $9 billion of 9% perpetual preferred stock). The New GM has a pipe dream of maintaining 19% of US market share (good luck with that). 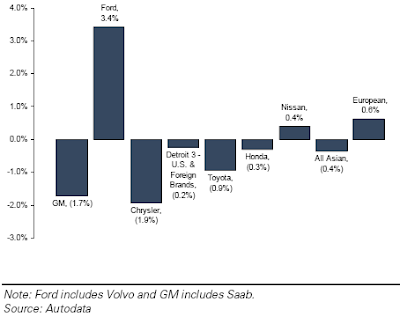 Saab, Hummer, Saturn, and Pontiac were approximately 3.6% of the market share, and are now gone from GM's portfolio. Remaining brands, Chevrolet, Cadillac, Buick, and GMC would need to recapture the market share lost from the "discarded" brands. 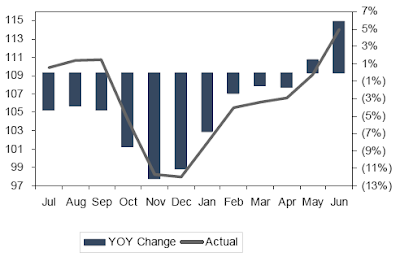 Below are the numbers for monthly US light vehicle sales (millions of units) including the seasonally adjusted chart (SAAR). 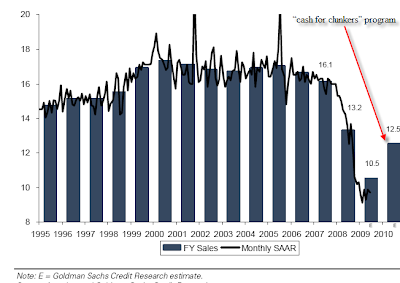 Sales in the US have dropped off the cliff according to Autodata and Goldman is predicting some recovery, mostly from the "cash for clunkers" program. 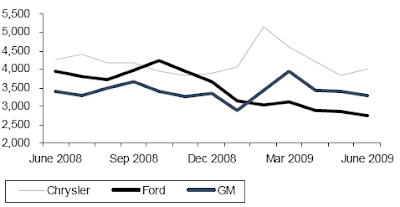 In therms of market share changes year over year, Ford has made some inroads grabbing share from GM and Chrysler. With plant shutdowns the Detroit-3 are bringing inventories under control after having a huge backlog. 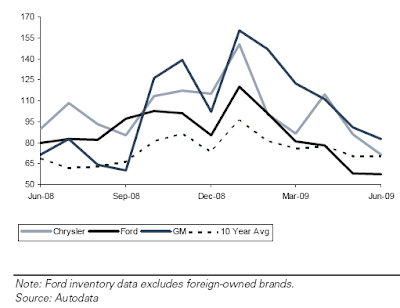 GM still has ways to go to get back to historical average, while Ford has dealt with the slowdown quite well by adjusting down the inventory. The Detroit-3 have been reducing incentives to customers simply because they can't afford it. The non-Detroit (foreign owned) US manufacturers however have been increasing incentives to move inventory (as they too struggle with collapsing sales) and grab market share. 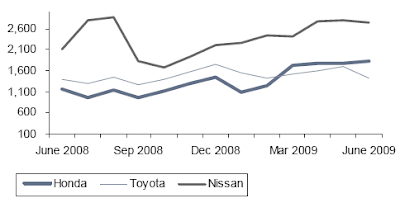 That's why Honda margins for example have been dropping significantly. The recession is having a strange effect on used car pricing. As people are avoiding new car purchases in order to reduce their leverage and monthly outflows, or are just unable to get financing, used car sales have picked up. With fewer people leasing and more consumers trying to buy a used car, the Manheim index of used car prices has spiked. Tough times for the industry will continue, impacting the rest of the economy (including the dealers). Until the credit markets pick up and TALF type ABS financing returns to the private sector, we will see a slow painful grind out of the most severe auto sector recession we've had since the industry's beginnings.